UNITY Shares Wellness Warrior app at Nike World Headquarters – UNITY, Inc. Fitness trainers and wellness coordinators in Indian Country shared culturally specific approaches to health and wellness at the recent Western Tribal Diabetes Project gathering held last month at the Nike World Headquarters in Beaverton, Oregon. Hosted annually by the Northwest Portland Area Indian Health Board in collaboration with Nike N7, the Native Fitness XV event attracted dozens of participants and presenters including UNITY’s Wellness Warriors Project Coordinator Josh Tso, Navajo. 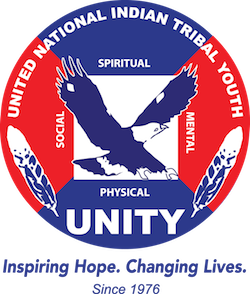 UNITY hopes that this valuable mobile app resources will be utilized by other youth serving organizations to enhance their wellness experiences. Others who presented at Native Fitness XV included Well For Culture, Nike N7, hoop dancer Tony Duncan (Mandan, Hidatsa, Arikara, Apache), and artist Bunky Echohawk, (Yakama, Pawnee). The Native Fitness event has attracted 1,500 participants from 170 tribes over the past 14 years.